For once this is only in English, the french version will come later in a separate post. Pour une fois ce post a été écrit uniquement en anglais. La version française viendra normalement un peu plus tard dans un post séparé. The moment I read about Casey’s project of a blog tour about collections, I knew I wanted to be part of it. I’ve always been collecting things since I was a little girl. I believe there is something that we could call a “collector mind or spirit” that some people have and others haven’t. Those who don’t can never understand the reason behind collections. And those who do tend to amass things. I have several consiously chosen collections that I have built over the years, and some that just kind of built themselves through gifts and unplanned buyings. It took me a while to decide what I was going to talk about. Of course just after my teaser post last Sunday I started a new sewing project that gave me a totally different topic idea. I actually started to write two versions of this post on totally different subjects. The more I thought about it, the more I felt the new version was a better match for this blog tour. So I’m switching subjects and keeping my first idea in a corner of my head for a future post. The collection I’m going to share is a treasure I discovered unexpectedly, not a collection I built myself, which is why I didn’t think of it as a suitable subject at first. 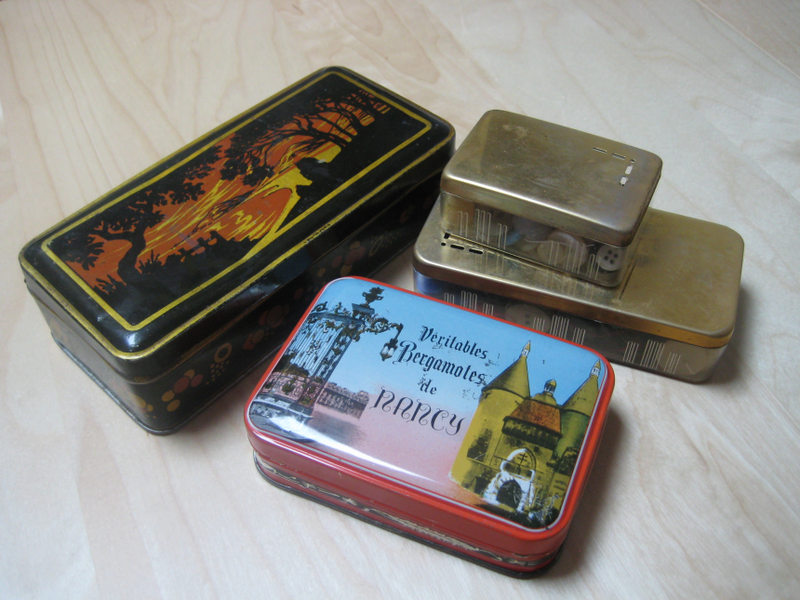 It is hidden is those old boxes and tins. Can you guess what it is (you can actually see a glimpse of the content through the plastic boxes)? I didn’t when I first found them. 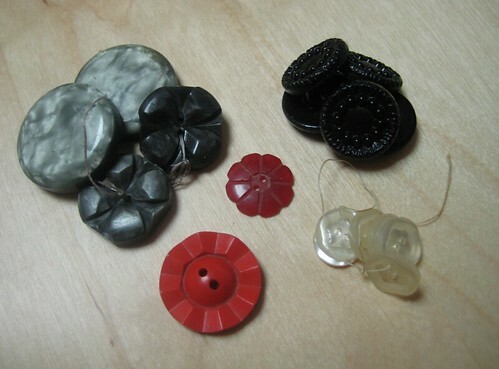 They contain a nice collection of buttons! To understand why it is special to me I have to explain how I came to have those boxes. When we arrived back in France in 2009 we were very lucky to find a temporary lodging among relatives. The people our house belonged to got too old to live by themselves so it was left empty, but wasn’t sold at first. We were allowed to live in there for some time in exchange for taking care of it. Those persons aren’t really blood relatives but I’ve known them since I was a child. I should say that the house hasn’t been emptied before we got there, so it was still full of its owners things. When we left we did a big clean up of all the rooms, going through everything. That’s when I discovered the tins, in a corner of the kitchen shelves. When I oppened them and found out what was inside I really felt like a child discovering a hidden treasure. I instantly called my mother to ask if I could keep them. Because of this it is a “cherished” collection in many ways. First because I’m happy to have those buttons to turn to when I need some. And the fact that they have a history of their own makes them that little bit extra specials. But what makes them really special is whom they belonged to. That lady and I have absolutely no blood in common, but she saw me grow up and I love her as if she was my grand-mother for real. Not being real blood relatives make things a little less easy now she doesn’t live in her house anymore, especially since she’s now at the other side of France. 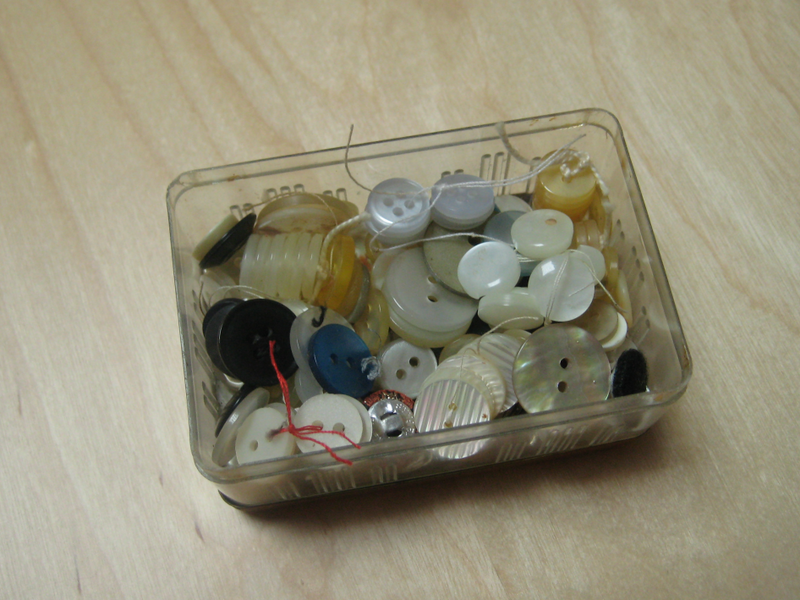 So I feel happy to have her buttons, it’s like a special gift from her to me because I’m the only one who sews. And of course the last reason that make those buttons so perfect for this tour is that they have been someone else’s cherished collection before. It probably took her some time to amass all those buttons. Maybe she took some out of old clothes, she bought others, and slowly it became this collection I inherited. Isn’t it great? There are different sizes and colours, although she seemed to like neutrals (light colors and blacks), blues and browns. Some of them seem to be the exact same design with slightly different colors. I wonder if it could be the effect of time on them or if they were different from the beginning. I love how she tied similar buttons together with a bit of thread! I never thought of that. I might do it with my other buttons. 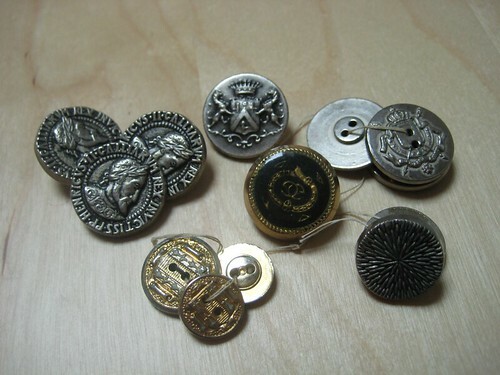 I included here a few pictures of some of the decorated buttons. I’ll leave you with more eye candy and less talk. I took the opportunity to share another collection with you: my lace/crochet doilies and motifs collection. Those pieces come from various places (the first ones I got in Japan), some are vintage, others are new. 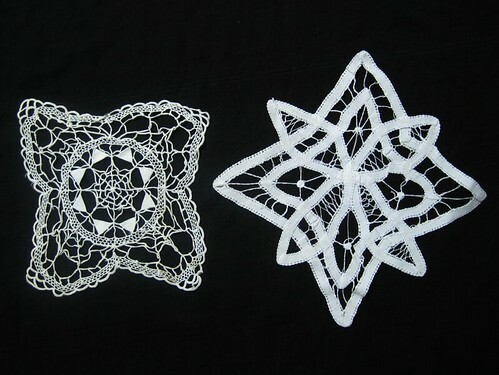 I think the thing that started this addiction is this book which gave me new ideas on how to use lace. 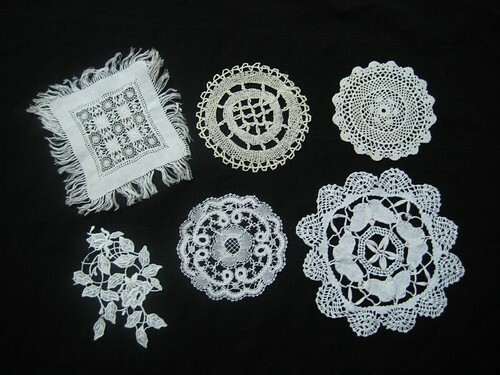 I love lace, I love how delicate and pretty it is. 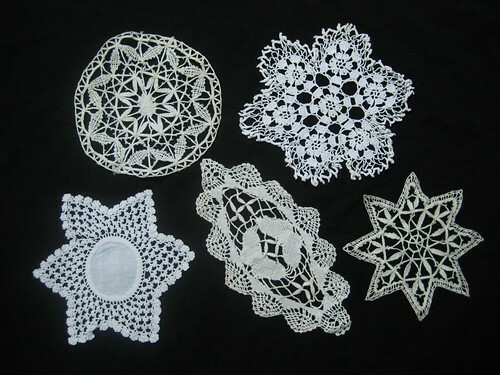 I’d love to use them as decorations in sewing projects (that’s the excuse I give myself when I buy them, I only get pieces I think I might use later). Edit: I’ve decided to include all the doilies pictures here instead of directing you to Flickr. ^^There are not so many so the post won’t be too long and it will be easier for you. My japanese treasures are some of the most important to me, along with some stamps collected with my grand-father when I was a child. I also collected many “things” of little interest in my childhood and now, I am so happy to find again those “treasures” with my daughter, or with friends searching for memories from the Eighties. 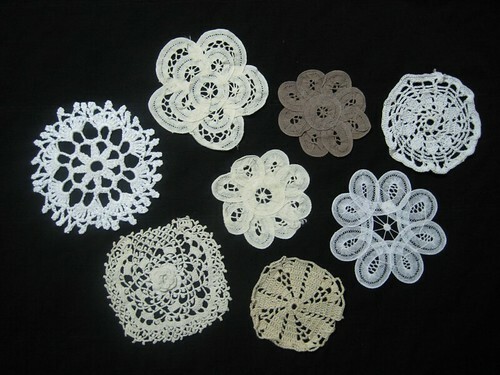 Your buttons are very nice, and the lace collection, so delicate ! Thank you for sharing your treasures (and thank you for the occasion to exercise my English ! LOL). 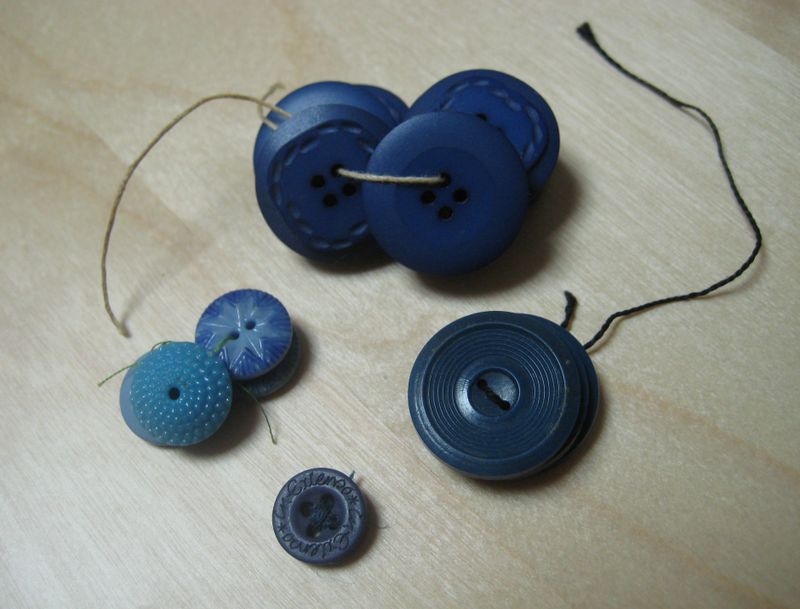 What a lovely combination…buttons and laces! I had to wonder if some of those metallic buttons (in the grouping where one said “Rex”) are historic or even reproductions? 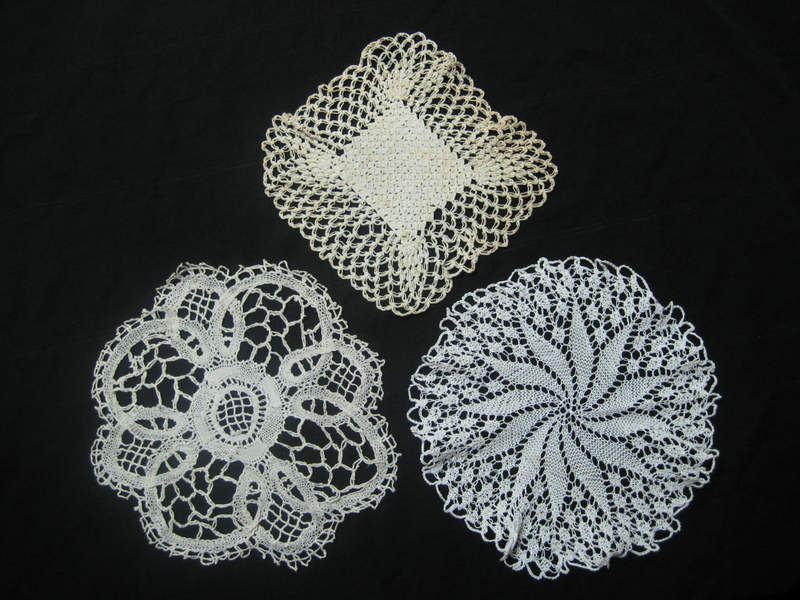 In the first photo of the lace, that has the bottom lace of the ivy is so unusual. How fun! I love your collections. I have a jar of buttons my dad gave me that were his mother’s. And I use them. 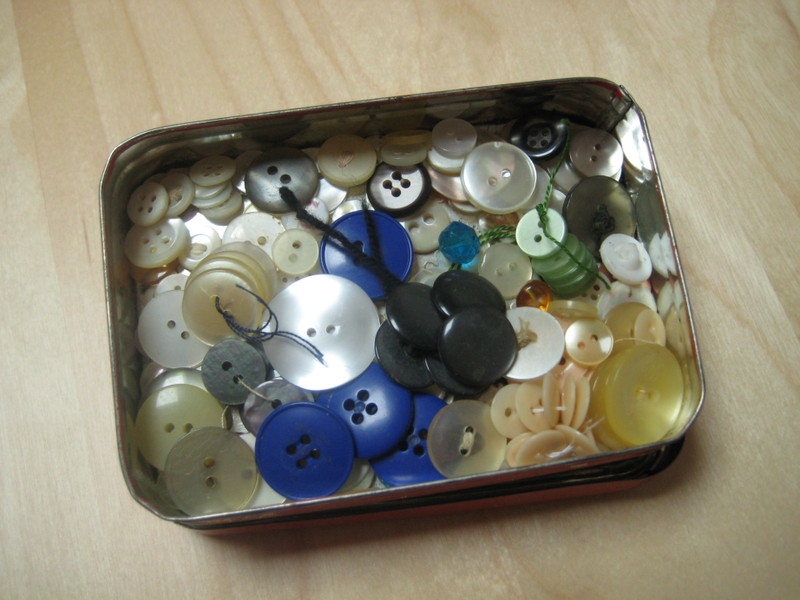 I also have a jar of buttons of my own. I love buttons. Also have doilies and some lace. 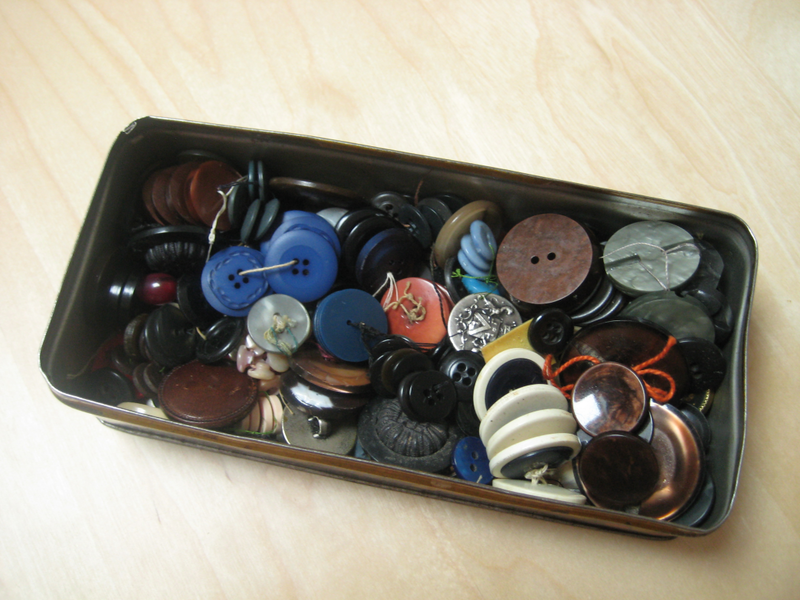 Wow, what a button collection! oh my! these are just wonderful! I completely understand what you mean about how they are extra special because someone else you love collected them- my husband’s grandmother gave me her button collection and it’s such a treat to comb through. What a lovely collection! 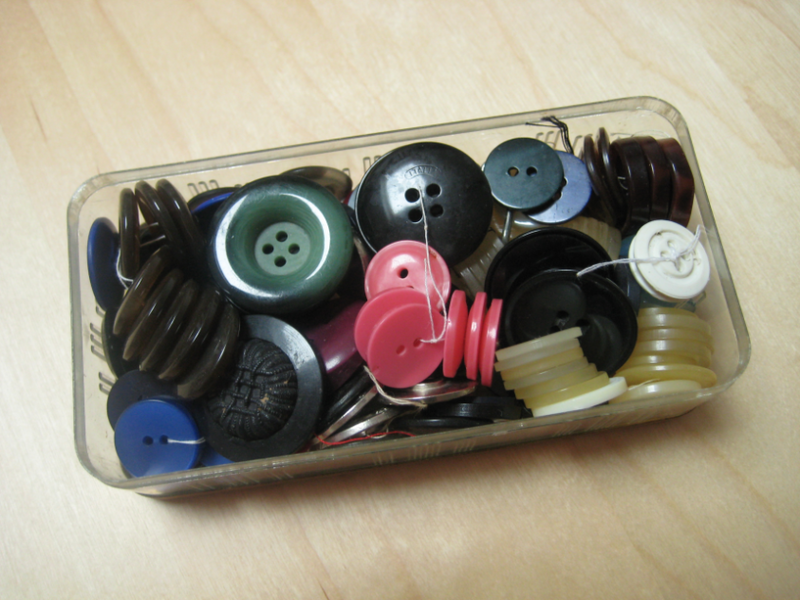 Some of your buttons are too pretty to use. I love your collections! 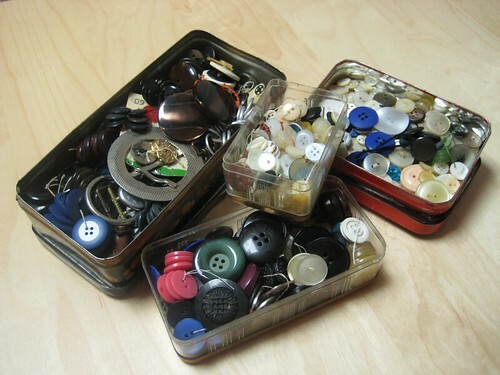 I have a bit of a vintage button collection too, my sister-, aunt-, and mother-in-law all send me amazing vintage buttons and one of my favourite stages of completing a project is getting out the button jar and choosing the right button(s) for the piece!